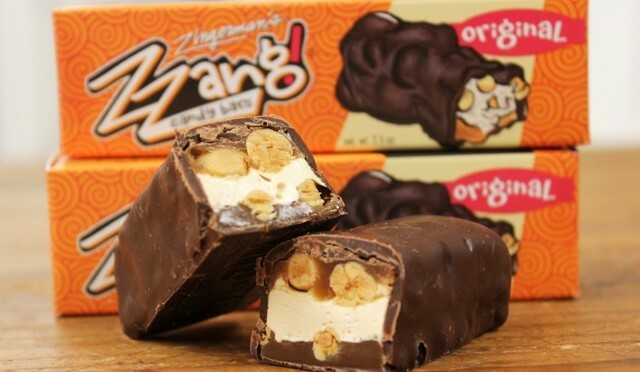 Zzang!® Original is the first bar we created back in 2002, and it’s still the most popular. It’s got the classic candy bar combination of peanuts, caramel and chocolate, and, as we’ve discovered with so many of the foods we make at Zingerman’s, it’s often the simple ones that gain the biggest following. Classic combinations are often good but what makes this bar great is our choice of ingredients. We use the best ingredients available: full flavored, 65% chocolate, freshly roasted peanuts, muscovado brown sugar from Mauritius, to name just a few. Besides including great ingredients in all of our bars we leave out the preservatives and chemicals often found in manufactured candy to prolong shelf life. You can pronounce and recognize every ingredient used to make a Zzang!® bar. This does mean that it’s best to eat our bars within a couple of months of when they’re made. Have no fear! We make our bars in small batches, daily, so it’s easy for you to enjoy them fresh. Candy making techniques are just as important as ingredients in creating a great bar. For the Zzang!® Original we make our nougat and caramel in small batches to make sure we achieve the perfect smooth and sensual texture we prefer. We roast and salt our own peanuts to get the optimal crunch and freshness. Once we’ve created all of the elements of the bar we dip each one into our rich dark chocolate.